Digital monitoring of air quality! 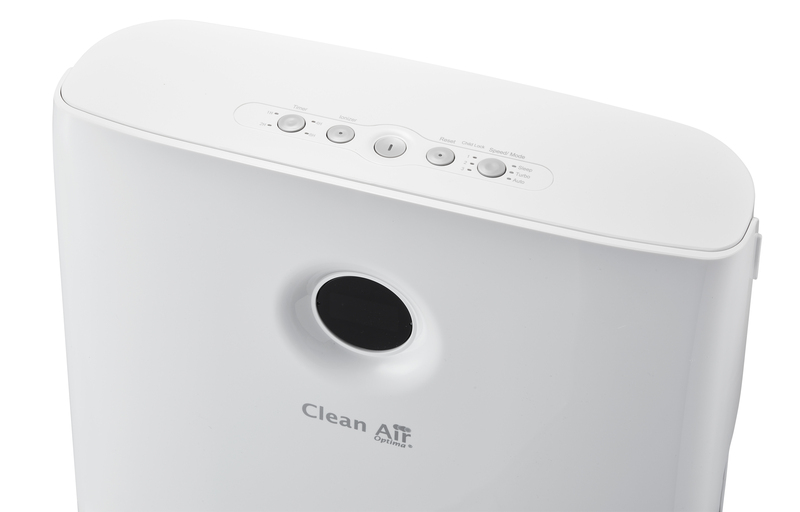 Intelligent Clean Air Optima® air purifier CA-509D for clean air! Optima Filter Technology / 5 OFT ™ Healthy Technology System! Clean air as prerequisite for good health! The quality of indoor air that we breathe is crucial for our health and well-being. The less dust, allergens, microorganisms and chemical pollutants we breathe in, the less we risk getting ill.
Indoor air pollution: an international health problem! Recent research of leading agencies such as the WHO (World Health Organization) and EPA (Environmental Protection Agency - the US American agency for the protection of the environment) has shown that indoor air at our work, in our living and mobility spaces is 2 to 5 and even 100 times more polluted with biological or chemical substances than outdoor air! The problem is reinforced by the modern ways of energy efficient building. Insufficient ventilation can cause the development and spread of bacteria, viruses, dust mites, mould, particulate matter and pollen indoors. More than enough reasons to pay attention to indoor air quality! 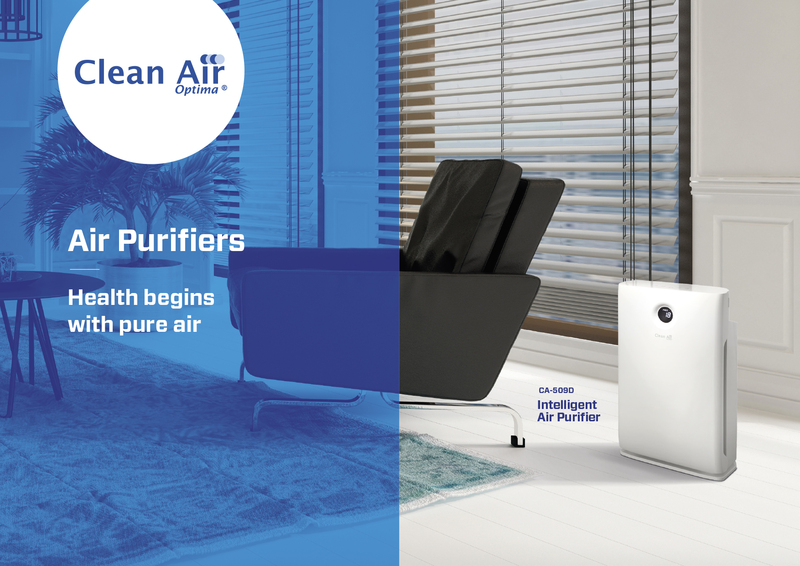 The new generation of intelligent and sensor controlled air purifiers with their unique Optima Filter Technology/ 5OFT™ purify air naturally without chemical substances. The excellent 5fold OFT filtration system transforms polluted indoor air into healthy air. The powerful and silent fan aspirates polluted indoor air. The integrated intelligent sensor automatically measures and regulates the indoor air quality. The fan anticipates automatically with 3 different speeds according to the measured PM2.5 level and particulate matter charge of the indoor air. The prefilter catches bigger dust particles and other pollutants such as hair and skin scales of pets. The Active carbon filter efficiently filters gases chemical substances, cigarette smoke, volatile organic compounds (VOC) and animal-, mould-, kitchen-, paint-, formaldehyde-, benzene-, ammonia-, nicotine- etc. smells out of indoor air. 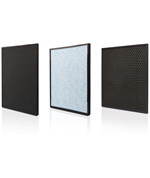 The antibacterial coating of nano silver on the filter eliminates bacteria and mould. Two ionizers with a total capacity of > 10.000.000 negative ions / cm³ that are spread throughout the entire room and thereby neutralize pollutants and smells. Negative ions attach onto dust particles, microorganisms and other unwanted particles in the air and connect them to each other. This way, the particles become heavier than air and fall onto the ground or are filtered by the air purifier. Clean, healthy air spreads indoors. The integrated intelligent sensor automatically measures and regulates indoor air quality. The fan anticipates automatically with 3 different speeds according to the particulate matter charge of indoor air. 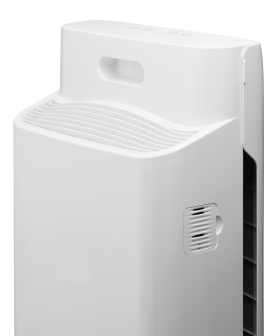 The air purifier type CA-509D indicates current air quality automatically and exactly on the digital monitor by measuring the indoor level of PM2.5, temperature and air humidity. Particulate matter is a collective noun defining air pollution with particles that are small enough to be breathed in. Particulate matter in the air can have negative consequences for human health. In 1999/2008, the European Union fixed threshold values for particulate matter PM10 (with a particles size of approx. 10 micrometer/10 microns) and PM2.5 (with a particles size of approx. 2.5 micrometer or 2.5 microns). The most important source of particulate matter, especially of PM10 indoors is tobacco smoke. Additionally, PM2.5 originates from chimneys, baking, cooking and vacuum cleaning. Important aspects for efficient air purification: relative air humidity between 40-60% and indoor temperature of approx. 20 - 25°C. The criterion for efficiency, the Clean Air Delivery Rate (CADR), determined in supplier independent lab tests, positions both air purifiers CA-509D and CA-509 by Clean Air Optima® at the top of the ranking of indoor air quality improving systems. The highly efficient filter system of both devices purifies the air from microfine particles up to 0,3 micrometer (0,3 µm) with 99,97% efficiency. (One micrometer equals 10-6 meters or 0,000 001 meter, a millionth of a meter or a thousandth of a millimeter). The CADR value indicates with which result the air purifier filters particles such as smoke, dust and pollen. This is measured by independent agencies in standard rooms up to 20,4m² and the measured values are located between 10 and 450 cubic feet particle free air per minute. The CADR value of the intelligent HEPA ionizer air purifier CA-509D amounts 363,6 M³ particle free air/hour. The higher the CADR value, the better the filter performance and the faster the air is purified from particles. 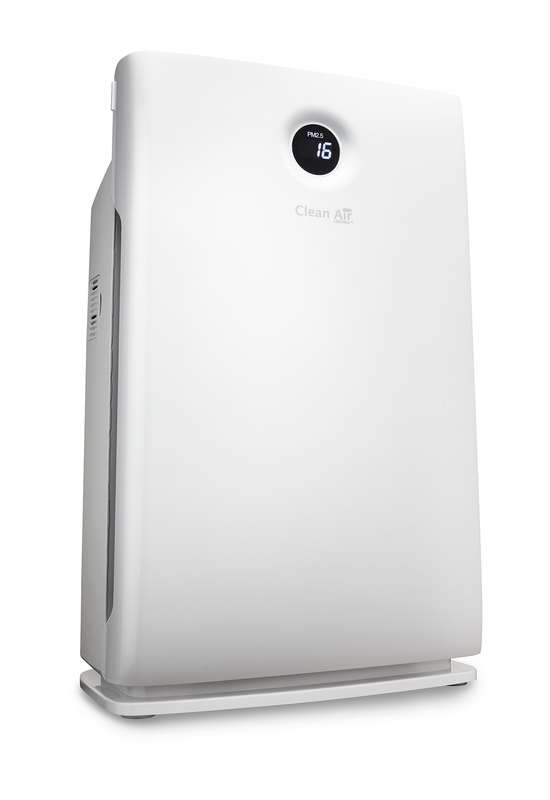 The intelligent high-end air purifier CA-509D by Clean Air Optima® guarantees healthy, purified indoor air to its users. The excellent 5fold OFT filtration system reduces risks of infections through viruses and bacteria, patients suffering from allergies can sleep quietly again and asthma patients can breathe more easily. Passive and active smokers feel much better. Sick-Building-syndrome causing indoor poisons such as formaldehyde and tobacco smoke lose their dangers for human health. The control panel on the upper side of the device is equipped with 5 buttons for an easy selection of the desired settings. The button in the middle is used to switch the device on and off. Easy to set to 1/2/4/8 hours. The air purifier functions for the set time and then switches off automatically. Whether the ionizer is switched on or off is indicated by a LED signal in the button. Replacing the HEPA and activated carbon filter after 2000 working hours. Press the reset button for 3 seconds straight for 0 - setting after replacement of the filters. The 3-settings of the fan offer individualized programming of the speed of the air stream. When in sleep mode, the purifier CA-509D by Clean Air Optima® guarantees a quiet sleep thanks to purified air and silent operating of the system as well as a dimmed monitor. The turbo setting takes care of powerful air purification. In the automatic setting, the integrated intelligent sensor measures and regulates air quality automatically. The fan anticipates with 3 different speeds according to the particulate matter charge of indoor air measured by the sensor. The child lock prevents unwanted use of the system. The child lock is turned on and off by pressing on both the Reset and the Speed/Mode button simultaneously. The flashing LED light of the button in the middle indicates whether the child lock is turned off or on. 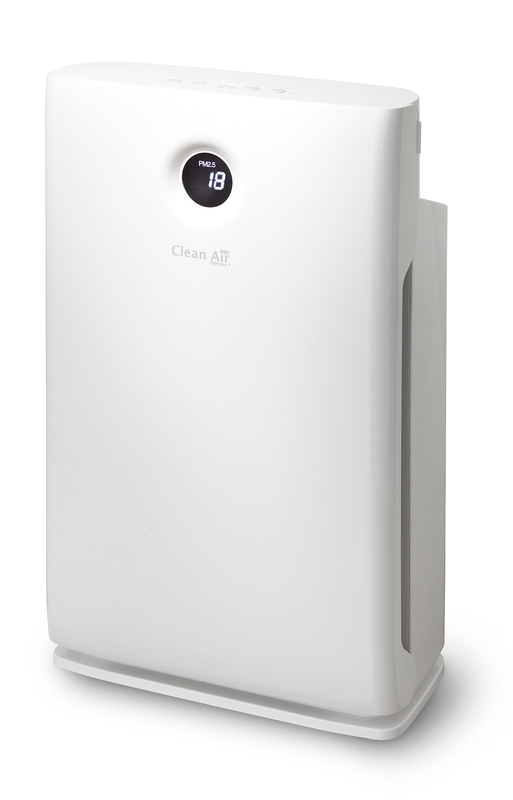 The intelligent HEPA ionizer air purifier CA-509D by Clean Air Optima® has a practical handle which makes it easy to move the device from one room to the other. 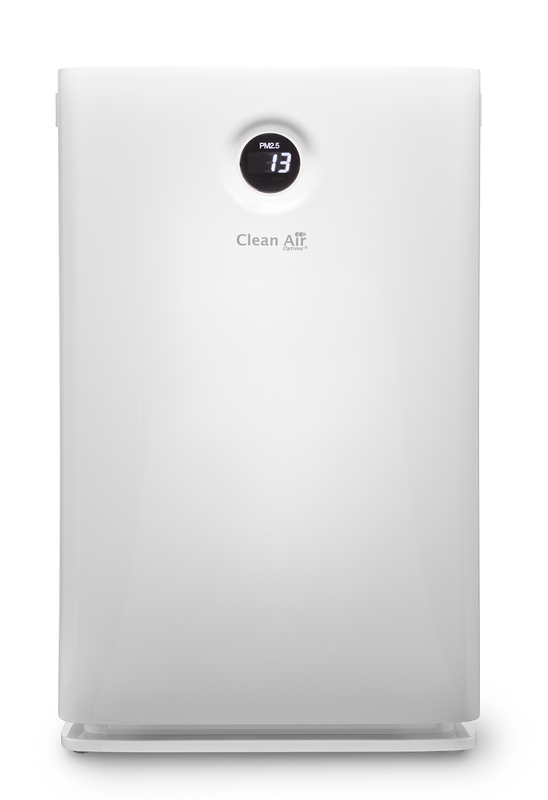 Its compact and stylish tablet design as well as its neutral colouring make the unique HEPA ionizer air purifier CA-509D by Clean Air Optima® suitable for every interior. The fan of the HEPA ionizer air purifier CA-509D is provided with three settings and a sleep mode. Power consumption of 12 Watt with fan set to low 1 / sleep mode. • Very silent with sleep mode! Indoor air is more polluted than outdoor air! Research has shown that indoor air is often 2 to 5 or even 100 times more polluted than the air outside. The EPA (Environmental Protection Agency) - the US American agency for environmental protection - and the WHO (World Health Organization) conclude that one should worry more about indoor than outdoor air pollution! Indoor places have become the typical place to be for modern humans. Often we spend 90% of our time indoors. 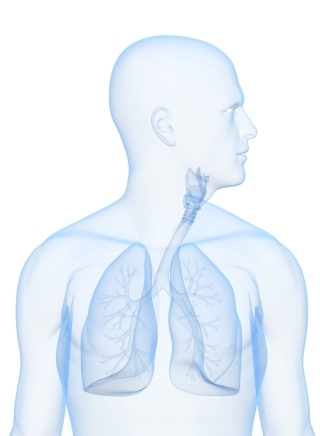 On average, a human being breathes in and out 18’000 to 24’000 times a day. This means that an average adult breathes in approximately 20 m3 of air. This volume corresponds to a weight of approximately 25 kilograms which highly exceeds majorly the volume of daily consumed food and beverages. While food and water can be carefully chosen, in general we have no choice regarding air. Air pollution is one of the bigger health problems in Europe. According to the Dutch Office for environment and nature, in the Netherlands 18.000 persons die 10 years earlier because of particulate matter concentrations every year. In polluted areas, children are suffering more often from respiratory problems and allergies and they develop weak lungs much quicker. It is necessary to ventilate, but air pollution will easier find its ways from inside into the house when doors and windows are open. But even if doors and windows are closed, allergens and microfine particles can get indoors by natural ventilation. Important aspects for efficient air purification. Relative indoor air humidity between 40 - 60% and a room temperature of approx. 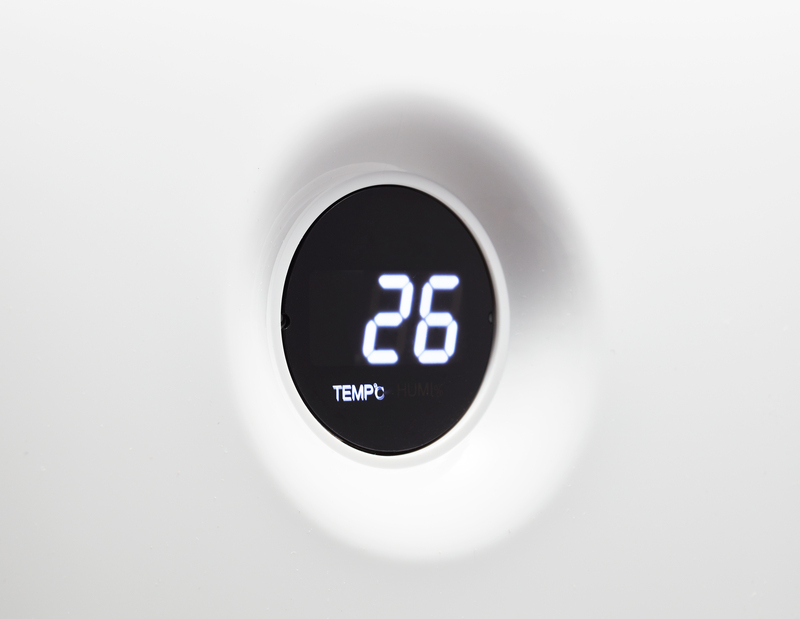 20 - 25° C are the most important aspects for efficient air purification. Optimal humidity in this range prevents the development of mould, bacteria and viruses, makes breathing easier, does not dehydrate the skin and increases general well-being. Pollen, mold, mold spores, dust allergens and other allergens can cause hay fever, asthma and other allergic reactions. Even short contact with high concentrations of microscopically small particles can contribute to the development of heart diseases. Microorganisms such as viruses, bacteria and mould spores are at the origin of tuberculosis, influenza, aspergillosis (causes by mould), MRSA (hospital bacteria) and SARS. Pet allergens are generally located in the saliva and hence on the hair and skin of pets. When the allergens are inhaled, it can lead to allergic reactions. Tobacco smoke contains thousands of chemical substances and floating substances that irritate the mucous membranes and can therefore cause acute or chronic diseases. Volatile organic compounds (VOCs) are chemical gases that emanate from vehicles, construction and industrial material. They can be carcinogenic and damage internal organs. New furniture of a house can liberate gases and VOCs. Smog and ozone can cause irritations of the respiratory tract and asthma attacks even with low concentrations. This kind of pollution mainly develops outdoors but can enter the buildings through doors, windows and ventilation systems. Cleaning products, sprays and dissolvents can irritate mucous membranes and worsen allergies such as asthma and hay fever. Its compact, stylish tablet design and neutral coloring make the unique HEPA ionizer air purifier CA-509D by Clean Air Optima® fit into every interior. In sleep mode, the device is particularly silent and therefore ideal for use in the bedroom and all rooms where silence is required. 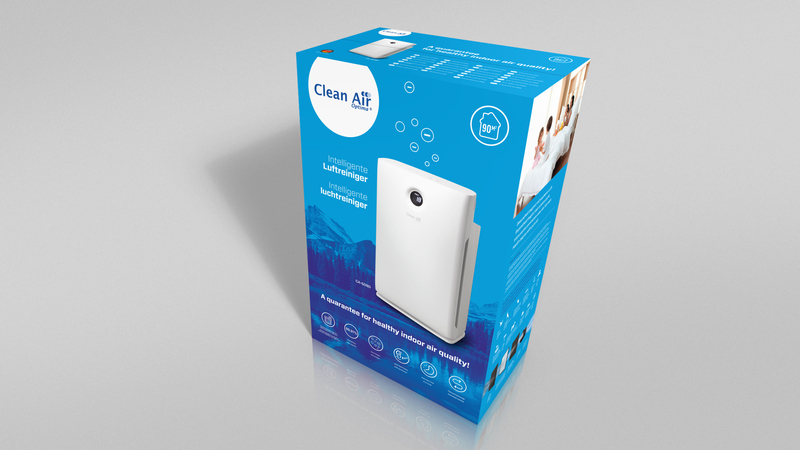 The large filter range provides many applications that enable the unique HEPA ionizer air purifier CA-509D by Clean Air Optima® to improve indoor air quality in: houses, offices, public spaces and buildings, at work, in companies, training and course rooms, shops, canteens, even at the hairdressers or the nail studio, in schools, museums, sport locations, practices of doctors, dentists and physiotherapists, in hotels, restaurants and spas, but also in animal shelters for dogs, cats and birds etc. etc. • Skin scales (dogs and cats). The high end CADR certified Clean Air Optima® HEPA ionizer air purifier CA-509D is ideal for professional environments. This progressive air purifier CA-509D with its excellent 5-fold OFT filtration system transforms polluted indoor air into healthy air, is easy to use and operating costs are low thanks to an advantageous purchase price and the longevity of the system. The HEPA ionizer air purifier CA-509D is perfectly suited for a large range of professional settings such as companies, gastronomy, health or educational organizations, museums and banks that consciously opt for fresh and healthy air resulting in a better climate for employees and clients. The intelligent HEPA ionizer air purifier CA-509D helps to prevent the “sick-building syndrome” and reduces costs that are entailed by absenteeism and lost working hours. 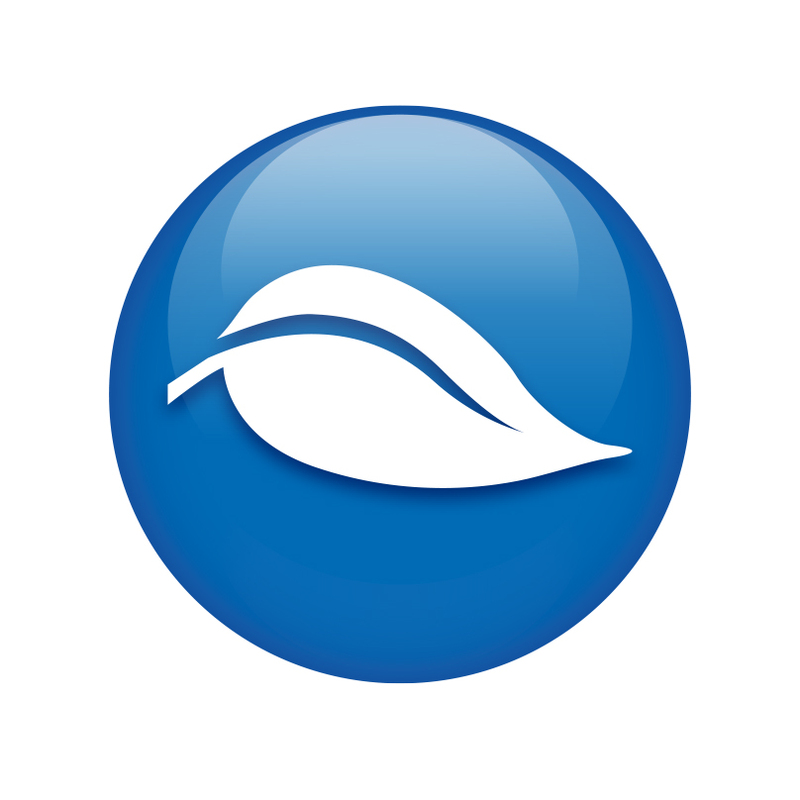 Our brand Clean Air Optima® represents our vision: achieve the best air quality in all imaginable indoor places. 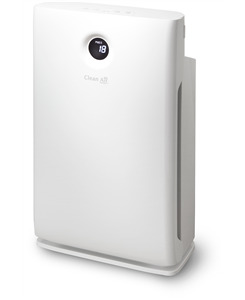 Both air purifiers CA-509D and CA-509 with the unique 5-fold Optima Filter Technology/ 5OFT™ are ideal for persons suffering from asthma, bronchitis, COPD, MCS and allergies caused by pets, pollen, dust mites and breathing in particulate matter, dust, bird dust, chemical substances and gases. Both Clean Air Optima® HEPA ionizer air purifiers CA-509D and CA-509 are particularly suitable for eliminating unpleasant smells and smoke and they contribute to a healthy and enjoyable living and working environment. The air purification system of this new Clean Air Optima® air purifier type CA-509D is based on the excellent Optima Filter Technology/5OFT™ and comprehends four filtering technologies + sensor. Functional order: Intelligent Particle Sensor™ / prefilter / active carbon filter / TRUE HEPA filter with nano silver coating and DUO ionizer. The integrated smart sensor measures and regulates air quality automatically. The fan, controlled by a sensor anticipates automatically to what extent indoor air is polluted by particles size PM2.5 and adapting with 3 different speeds accordingly. The digital display on the front side of the stylish air purifier CA-509D indicates automatically and exactly current air quality by measuring the level of PM 2.5, indoor temperature and humidity. The effective Clean Air Optima® 5 OFT™ filtration system transforms polluted indoor air into healthy air and reduces practically all unwanted substances and smells: pollution particles up until 0,3 microns (such as very small particles, allergens/pollen, mould spores, dust mites and skin scales), bacteria and viruses, tobacco smell, odours, gasses and TVOCs. Optima Filter Technology / 5OFT™ - Intelligent Particle Sensor™+ PM2.5 monitoring protects against the risks caused by inhaling particulate matter, allergens, bacteria and viruses. Particulate matter of 10µm (PM 10) and smaller 2,5 µm (PM 2.5) can get into the lungs and belongs to the top 10 threats for human health. These small particles develop through typical indoor processes such as cooking, baking, frying, smoking, as well as heating or are also transported in big quantities into indoor air because of transportation, industry, construction, biological material (pollen, bacteria, mites, and viruses), imported particles from other regains such as (airplane) exhaust gases and volcano eruptions. Allergens such as pollen and dust cause serious and long-term health threats to millions of persons each spring: the numbers are increasing constantly. Hay fever is an allergic reaction that is caused by pollen (anther dust) of grass, trees and all sorts of herbaceous plants that are transported by the wind. Pollen is composed of microscopically small granules that develop in the stamen of flowers, grass, bushes and trees. Sometimes they are so light that they float in the air. Most of the pollen granules measure between 10 and 30 microns (one micron is thousandth of a millimetre). Out of thousands of plants that spread their anther dust in the air, there are a few hundred species that can cause allergies. This mostly concerns plants with light-coloured blossoms that are not noticed by insects. Bacteria and viruses are difficult to detect. The Optima Filter Technology/ 5OFT™ with turbo function increases air streams, accelerates air refreshment and thereby reduces air pollution as well as health threatening particles. The HEPA filter with nano silver coating is important for this air purification method because it eliminates practically all bacteria and viruses in indoor air and produces fresh air. 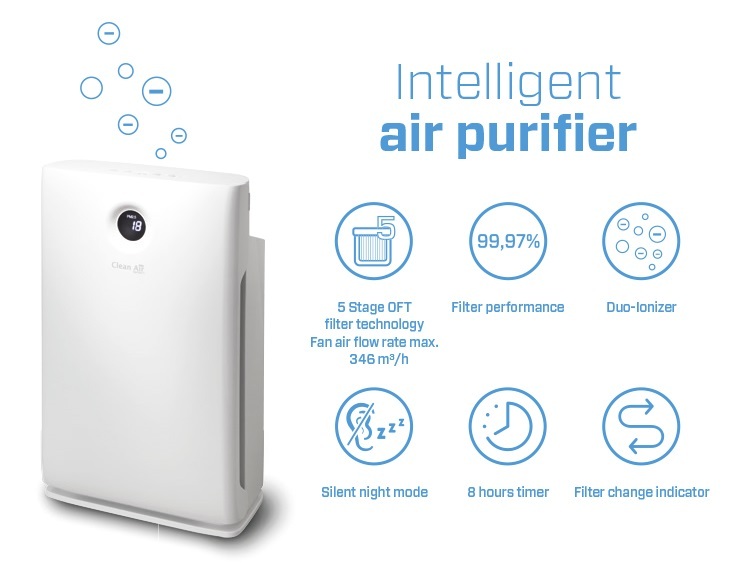 The intelligent Clean Air Optima® Hepa ionizer air purifier CA-509D with efficient Optima Filter Technology/ 5OFT™ creates a healthy indoor climate in rooms up to 90m2/225m3 by providing 363, 6m3 particles free air/hours. The prefilter retains bigger floating particles and other harmful substances. The active carbon filter efficiently purifies the air from gases, chemical substances, smoke, volatile organic compounds and smells from pets, mould, cooking and painting. The integrated smart sensor measures and regulates air quality automatically. The fan, controlled by a sensor anticipates automatically to what extent indoor air is polluted by particles size PM2.5 and adapting with 3 different speeds accordingly. The digital PM2.5 monitor informs directly about air quality, temperature and humidity indoors where the high-quality HEPA ionizer air purifier CA-509D by Clean Air Optima® is installed. CADR is the abbreviation of Clean Air Delivery Rate. The Clean Air Delivery Rate (CADR) is the term describing air purification capacity of an air purifier. This makes it possible to get a clear idea of the efficiency of an air purifier. The higher the CADR, the better the filtering performance and the faster the air is purified of particles. Independent organisations measure the values in standard rooms of 20,4m2 and the measurements are situated between 10 and 450 cubic feet particle free air per minute. The CADR value of the intelligent Clean Air Optima® HEPA ionizer air purifier type CA-509D reaches 363,6 M3 particle free air/hour. The HEPA ionizer air purifier CA-509D by Clean Air Optima® is a high-tech product with high CADR value producing clean, healthy indoor air and taking care of your health and wellbeing all year long. The intelligent Clean Air Optima® HEPA ionizer air purifier CA-509D guarantees its user a peaceful and healthy night. When in sleep mode, this air purifier is almost silent, the light of the monitor dims automatically and the air purification is reduced to a lower level by slowing down the speed of the fan, the sound is decreased and energy consumption reduced. • CADR value: 363,6 M³ particle free air/hour. tobacco smell 98,90%. The antibacterial layer with nanosilver coating on the filter eliminates bacteria and mould. 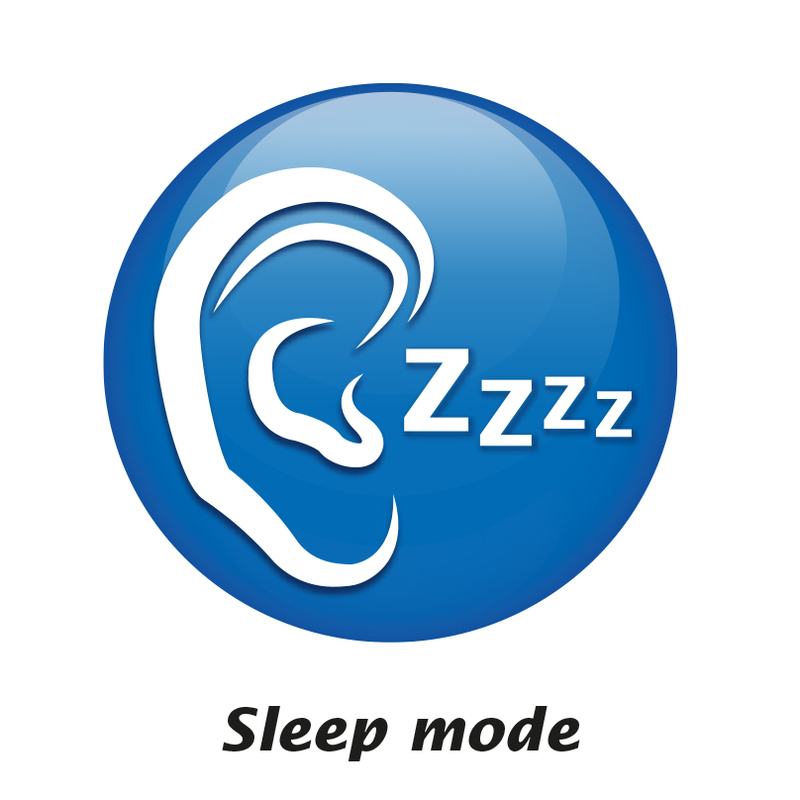 • Ultra silent with sleep mode for the bedroom! Before starting the device, kindly consult the detailed instructions in your manual. Summary of the procedure for starting the intelligent HEPA ionizer air purifier CA-509D. 1. Grab the front panel at the upper side and press with both index fingers against the latches on the upper side of the panel: then pull the panel towards you and up, out of the device. 2. Take the HEPA and active carbon filter out of the device by pulling both filters at the on the upper part towards you. 3. Remove the protection plastic from the filters. 4. First insert the Active Carbon Filter filter back into the device with the tab visible at the top. 5. Then place the HEPA Filter back into the device with the tab at the top. 6. Put the front panel into place. 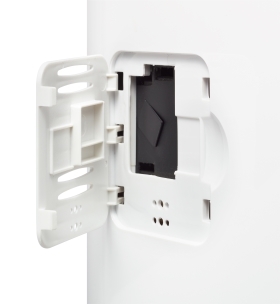 Place the front panel back into the device, putting both hooks into the recesses and then click the front panel on the upper front gently back into the lock. Consult the manual with detailed instructions for replacing the filters. Summary of the procedure for how to replace the filters of the intelligent HEPA ionizer air purifier CA-509D. The intelligent HEPA ionizer air purifier CA-509D is equipped with a filter lifespan surveillance mechanism that signals that the filters have to be replaced after 2000 working hours. To show that filters need to be replaced, the purifier emits a flashing LED signal. Push the reset button for 30 seconds and after the sound signal the LED light switches off. After having replaced the filters and placed back the front panel, press the reset button for around 5 seconds. After hearing the sound signal 3 times, the LED function for the lifespan surveillance of the filters is activated again. Depending on the use, the HEPA filter has a lifespan of approx. 6-8 months and the activated carbon filter as well as the prefilter of 12 months. 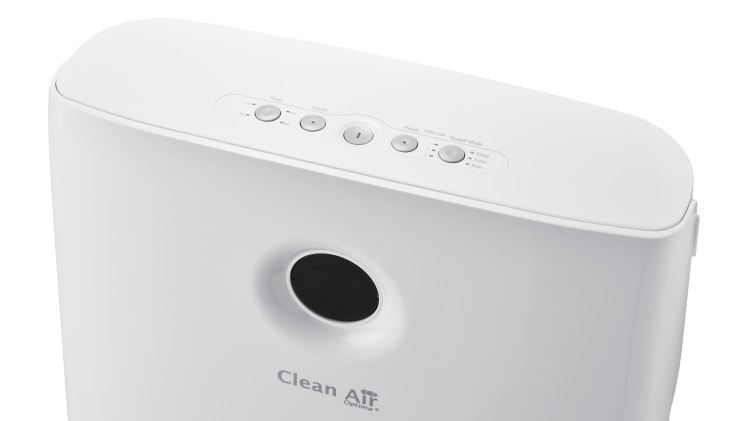 Cleaning of the filter: for optimal efficiency, clean the filters once a month (see manual air purifier CA-509D chapter “Cleaning and maintenance”). Signs of used up filters: more noise, less air movement, clogged filters and increasing presence of smells. When the HEPA filter changes its colour, from white to greyish or black, the filter needs to be replaced by a new one. If the HEPA filter remains white, it does NOT need to be replaced. Catches big dust particles such as: fluff, hair and skin scales of domestic animals. The prefilter lengthens the lifespan of the TRUE HEPA filter. TRUE HEPA catches 99,97% of all floating particles and allergens such as scales of pets, dust mites, pollen, bacteria and viruses >0,3 microns. Nanosilver is a filter coating to which an antimicrobial agent is added in order to eliminate bacteria and viruses and to stop the growth of mould, mildew as well as odour creating microbes at the surface of the filter. Active carbon neutralizes smells, chemical substances, gases and smells and also prevents growth of bacteria, viruses and mould. Depending on the use of the filters, they need to be replaced every 6/8-12 months. You can order the replacement filters on our website under: Accessoires. highly recommended. Our air quality is better with the device. It is silent, good design, easy to clean and replace the filters. The display shows also the temperature and humidity, which is cool. It would've been better if there was a switch on timer too. I hope that this air purifier does it's job. The product is great and worth it’s price. Nous avons commandé 3 exemplaires du CA-509D. Un pour le salon et deux pour la chambre à coucher. Nous fumons dans le salon et la fumée de cigarette est très rapidement éliminée si le purificateur est allumé. De plus, les mauvaises odeurs sont neutralisées. Dans la chambre à coucher, il y a moins de poussière et nous dormons beaucoup mieux ! !